Three months ago, Snail Games officially re-revealed Dark and Light. After purchasing the rights around eight years ago, the development studio took its own time to redesign a game that could incorporate the original concept with modern mechanics. The result is a game that attempts to mix survival, sandbox, MMO and RPG elements on a rather distinctive high fantasy backdrop. Powered by Unreal Engine 4, the game can be played in either first-person and third-person view. Upon entering the game world you’ll be prompted to choose between one of the most common fantasy races (humans, dwarves and elves), though there are some differences to the usual depiction of these races in other fantasy games. Player-versus-Player (PvP) combat will be possible outside cities even among members of the same faction, anyway, but if PvP is not your thing PvE servers have already been confirmed. At the beginning of the game, players spawn in “shantytowns”. As they progress they’ll be able to afford a better home as well as improving it in various ways (such as increasing its defenses). Eventually, the most accomplished players may be eligible to become Lord of the City and guide citizens in all matters from housing to trade and war. In case you’re not a fan of crowded cities, it will be possible to build houses and settlements almost anywhere in the world. We also know that magic will play an important role in gameplay, not only for combat but also for survival; for example, fire magic can keep you warm in a cold environment and cook food. Enterprising players may try to tame some of the animals that roam around the world (including unicorns), each one empowered with unique innate abilities. We’ve reached out to Snail Games in order to learn a bit more about Dark and Light and Associate Producer Jonathon Stebel was kind enough to answer a few questions. Will there be any way to fast travel across the map? There are a few ways players can travel long distances – as for fast travel, players can construct teleportation portals around the world and travel between them at will. They can also use flying mounts if they want to take a more scenic route. Are there different continents to this world and if so, will players need ships to travel the sea between them? Are you planning any form of ship combat? Dark and Light’s world is mostly land – you won’t need to travel across the sea to get between continents, but we do have some unique land forms like floating islands that will take some work to get to. Ocean-based combat isn’t something we’ve put a lot of consideration into, but we do have some ocean-based / underwater exploration and PvE content. We know that there will be mounts capable of flying, such as dragons. Do you have any plans for air combat in Dark & Light? Air combat is definitely possible in Dark and Light with offensive flying mounts like griffins and dragons, but it’ll probably need some fine-tuning during the Early Access period. You recently said that survival is at the core of Dark & Light’s gameplay. Can you please go into detail of the survival elements in the game – what will players have to do in order to stay alive? By that, we mean that Dark and Light plays more like a survival game than anything else – it’s important for players to manage their character’s hunger and thirst, be properly equipped for biomes with extreme temperatures, build and protect their main base (if they choose to construct one outside of their starting faction city), and generally learning the lay of the land. Hunger / thirst and temperature will be a little less intrusive than in other modern survival games, and we’ll probably be adjusting these mechanics during Early Access. 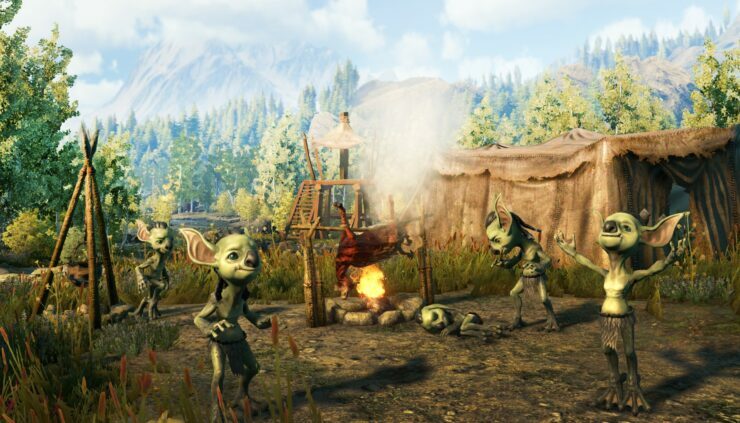 Can you clarify once and for all if Dark & Light will be an MMO in terms of server population size, rather than limited to 50/60 players like multiplayer survival games? We’re not quite ready to commit to a hard number, but server population will be far less than traditional MMOs. Early access is going to help us stress test our servers to see exactly what we can handle in terms of max player cap per server. To help clear things up a little bit, Dark and Light should be thought of more as an open world multiplayer fantasy game with survival / MMO aspects, rather than an MMO with survival aspects. We’ll keep covering Dark and Light ahead of its projected Steam Early Access before the year’s end, so stay tuned for more information on this upcoming survival MMO/RPG by Snail Games.